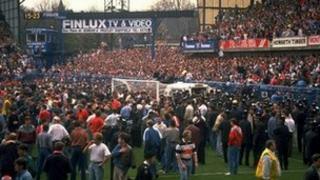 A reference group has been appointed to oversee the Hillsborough inquiry on behalf of the victims' families. The three-strong independent panel will ensure their rights and interests are safeguarded during the investigation. It has been set up by the inquiry teams and Crown Prosecution Service (CPS) separately to the inquests. The panel will include criminologists Dr Silvia Casale and Prof Roger Graef and retired judge Sir Stephen Sedley. They will meet every two months. Ninety-five victims were crushed to death in Britain's worst sporting disaster, on 15 April 1989, at Sheffield Wednesday's Hillsborough stadium during Liverpool's FA Cup semi-final against Nottingham Forest. The 96th victim died in 1993 when the Law Lords ruled that doctors could stop tube-feeding and hydration. Fresh inquests into the deaths are due to begin by 31 March. The reference group has been set up by the Independent Police Complaints Commission (IPCC), the CPS and the Operation Resolve investigation team, which is led by retired chief constable Jon Stoddart. A CPS spokeswoman said: "The group's purpose is to ensure the families' rights under Article Two of the European Convention on Human Rights, which requires public accountability and the appropriate participation of the families of those who died to safeguard their interests during the investigations." The spokeswoman said the work will "not impinge on the conduct of the resumed inquests; this is an independent judicial process that cannot be subject to review by others." Whilst the inquests are ongoing, the reference group will monitor the progress of the investigations through regular meetings. The group will have a secretariat provided by the CPS, but will function independently. Talks were held with the families earlier this year about setting up a panel.